Be consistent in holding daily family prayer, and weekly Family Home Evening. Teach gospel and basic values in the home. Establish a love for reading the scriptures together. I have especailly been thinking about what traditions I can do with my family. I love traditions, and any chance to celebrate I seize upon. While thinking about it today, I decided that it would be a good idea to research some of my husband's ancestery and to adopt some of their traditions. Our heritage is something so special and important. I decided to focus on his, because not much is known about his predecessors or heritage. They are Norwegian, and his grandfather is a first generation Mormon. Since no one speaks Norwegian, none of their family history has been done either. I figure a good first step will be to adopt some of their traditions and I am so excited! I found their Independence Day is May 17th, so I am not sure what we are going to do to celebrate that, but they have a Midsummer Festival on June 23 to celebrate the longest day of the year and celebrate Summer in general. They have a party that goes deep into the night, and have lots of flowers and lights to decorate it, along with lots of good food. I am so excited to host this party! They also celebrate a day in December called St. Lucia's Day. On that day people are prohibited to work. If they work they will be cursed for the whole of the coming year. What fun this will be. I just need to learn about some of my roots traditions. I am almost completely English, but I do have a bit of Scandinavian blood in me. I just need to find out exactly which countries, and then learn their traditions. What fun this will be. I have more days to celebrate, and I will be teaching my son about the importance of family, and his ancestry! I can kill two birds with one stone! What are some of your traditions and celebrations that you have with your families? What are some things you would like to start? To Read Elder Ballard's talk, click here. We do New Years stockings (kinda like Christmas stockings only a bajillion times better, seriously hehe). I want to try to make more traditions with Martijn but currently adjusting to a new culture is taking up most of my energy. I want to learn about New Years stockings, that sounds wonderful! I may have some Danish, I am not sure. I am going to research my mother's side and see what I come up with. If I need help, I will call on you. Thanks a ton, and good luck with the cultural adjustments. I admire you, that would be very hard. Aw, Thanks Shannon. You just made my day. Good luck with making traditions with your family. I think it is something so fun to do. For example, it is now a tradition that I rush off to the store and buy Girl Scout Cookies as soon as they start selling them nearby. I think my hubby would rather I forgo that one, but it makes me and the toddler happy, so what can you do? We mix up some Venezuelan traditions for Christmas and New Years. For Christmas the kids stay up until midnight and then open their gifts from "Baby Jesus." We tried that last year but our kids fell asleep. Maybe when they're older? Also for New Years, during the 10 second countdown you hurry and eat 12 grapes and make a wish with each one. Pin~atas for birthdays and some other stuff that we've done off and on but aren't consistent enough to follow through with. Thanks for the inspiration! 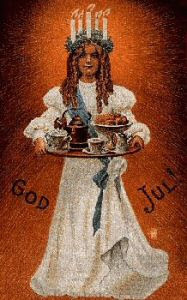 The Swedish celebrate St. Lucia day too! Some years, if we remember, we'll make orange rolls to celebrate. When we were younger one of my sisters would actually come into our rooms and wake us up with the rolls and some hot chocolate. It was fun! How fun! Do you also have tamales on Christmas Eve? Is Pedro from Venezuela? I like your grape idea. I generally kiss my hubby at midnight (yes, I know, not very origional). Maybe I will have to combine the two. I am glad this helped you. I think you should pull out your paper and implement some of the traditions you thought of. So what if you don't have kids yet. You can have other traditions that don't need children yet. It may be a bit harder to come up with, but do it anyways. I think that we need to create memories together to strengthen our relationships. I did know that St. Lucia is also Swedish. I just found out that my family is from Sweden (and Denmark) as well, so if there are any other fun traditions you know of, let me know. I want to tart implementing them more. I think I want to do the orange rolls and hot chocolate too. That sounds so wonderful! That sounds wonderful! We are certainly looking for more traditions. My family is also Norwegian. We haven't really celebrated their holidays, but we love to eat like them. One of our favorites is the way they eat pancakes. My great Grandfather (he was brought over to America by the Mormon missionaries) sent this through the generations. They butter the pancake, then sprinkle sugar on it, fold it in half and then eat it almost like a taco. Yummy, my favorite. We have also made some really good cookies a few times too. If you find any more food traditions (or any traditions in general) from Norway, let me know. I would love to hear more! Thanks for the awesome post.